Philadelphia, PA – Governor Tom Wolf joined House and Senate Democrats today to announce a package of reforms to strengthen protections against sexual harassment and discrimination for employees, provide new legal options for victims and hold those who are responsible accountable for their actions. These steps build on Governor Wolf’s efforts to combat sexual harassment and assault, including the nation’s first state-based ‘It’s On Us’ campaign to combat sexual assault on campuses, which includes grants to higher education institutions and a bipartisan legislative package. Ban mandatory non-disclosure agreement: Forcing victims to sign non-disclosure agreements in cases of sexual assault and harassment helps serial predators to continue their patterns of abuse. Governor Wolf supports a revised version of Senator Schwank’s legislation that would prohibit mandatory non-disclosure agreements unless the victim voluntarily agrees to include one. Protect more workers: All employees should be protected, regardless of the size of the employer or the type of their job. Today, these protections are only given to those who work for an employer with at least four employees. Governor Wolf supports reducing the threshold to one employee and extending protections to independent contractors, interns and full-time nannies, housekeepers and other domestic workers. Legislation proposed by Sens. Farnese, Fontana, Tartaglione and Williams and Reps. Rabb and Madden. Workplace training: No employee should experience harassment or discrimination This legislation requires trainings for employees and supervisors to prevent discrimination and harassment for all employees and employers must display discrimination and harassment protection rights in the workplace. Legislation proposed by Sen. Fontana and Reps. Rabb and D. Costa. “PA Fairness Act”: Governor Wolf is renewing his call for the General Assembly to pass the PA Fairness Act to prohibit discrimination based on an individual’s sexual orientation or gender identity or expression. Legislation proposed by Sens. Browne and Farnese and Rep. Frankel. Extend statute of limitations: Some victims and whistleblowers can be afraid to come forward. To encourage reporting, the amount of time victims have to file a discrimination or whistleblower complaint should be extended from only 180 days to two years. Legislation proposed by Sens. Farnese and Haywood and Reps. Davidson and O’Brien. Right to a Jury Trial: Victims and whistleblowers should have the option for a jury to hear their case in state court. Legislation proposed by Sens. Farnese and Haywood and Rep. Davidson and O’Brien. Punitive Damages: Pennsylvania, through the Pennsylvania Human Relations Act and the Whistleblower Law, should join other states, like New Jersey and Ohio, that allow victims and whistleblowers to seek punitive damages in workplace discrimination cases. Legislation proposed by Sens. Farnese and Haywood and Reps. Davidson and O’Brien. Payment of Attorney Fees: Burdensome legal fees can discourage some victims from pursuing their case. Sexual harassment victims who win their case in state court should have the attorney fees paid by the defendant. Legislation proposed by Sen. Farnese and Rep. Davidson. Sexual Harassment Prevention Task Force: Governor Wolf and House and Senate Democrats are calling for the creation of a task force to bring together victims’ rights organizations, government officials and others to make recommendations to prevent sexual harassment and discrimination in the workplaces. Legislation proposed by Sen. Blake and Rep. Pashinski. Invest in Investigations: Pennsylvania’s Human Relations Commission is underfunded and understaff. Governor Wolf’s 2018-19 budget proposal is a first step to strengthen the Human Relations Commission with an additional $1.3 million to investigate discrimination and harassment cases. These additional resources would allow the Commission to hire an additional six employees to help process complaints. Standards for Lobbyists: The state Capitol must be free of sexual harassment and discrimination for employees and the public. Governor Wolf is calling for legislation that requires lobbyists to go through training for ethics and discrimination and holds them accountable for violating discrimination protections. Legislation proposed by Sen. Brewster and Rep. Snyder. As part of the effort to reduce sexual harassment and support victims, the Wolf administration today launched a webpage about reporting workplace sexual harassment and providing information from victim’s rights groups. 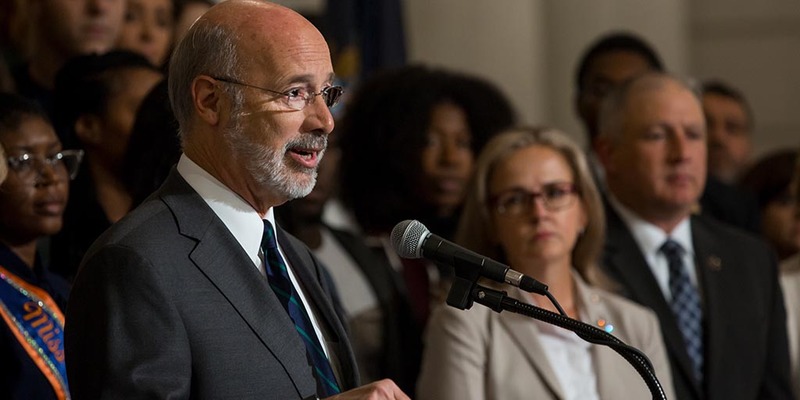 Governor Wolf has also directed his administration to evaluate sexual harassment policies and training for commonwealth employees to identify possible improvements.